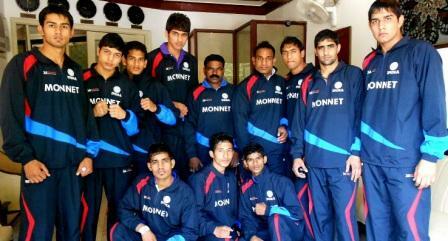 A 13 member youth Indian boxing team, including ten boxers two coaches and one doctor left for the beautiful city of Subic Bay, Philippines, for the twentieth edition of the Asian Youth Boxing Championship, on Saturday (9 March 2013). No less than 130 fighters, representing 26 countries, will battle it out for the continental crown in the Asian Boxing Confederation (ASBC) Youth Boxing Championships. The competition begins on 11th March 2013 and concludes on 17th March 2013, in the coastal town of Subic in Zambales. The tournament also being referred to as “Boxing By the Bay”, will feature some of the finest performers in the 17-18 year old age bracket in 10 weight divisions, it will also witness some of the top boxers, who ruled the canvases at the 2012 Youth World Boxing Championship in Yerevan, Armenia. In the previous edition of the tournament at Tehran, Iran in 2010, the Indian team did exceptionally well with nine out of ten boxers returning with medals. The Indian pugilists bagged two gold medals (Vikas Krishan 60kg, Naveen 81kg), three silver medals (Devendro Singh 49kg, Venkatanagarjuna 57kg, Sumit Sangwan 75kg) and 4 bronze medals (S Surisetti 51kg, Harpal Singh 64kg, Manoj Kumar 91kg, Rajat +91kg). The current Indian Junior/Youth squad who had been training at the SAI Western Training Centre in Aurangabad, under the supervision of Coach-in-charge G Manoharan, are a talented bunch of boxers, but will have a tough ask replicating the success of 2010. Coach Manoharan though, feels positively about the chances for his wards. He said, “It is not going to be easy matching the performance we had in 2010, but the boys have done well in training and also in the Youth World Championship last year. I am confident of having a favourable result this year as well”. Leading the Indian charge in Subic City will be the likes of 2012 AIBA Youth World Championship silver medallist Narender Berwal (+91kg), bronze medallists at the 2012 Youth Worlds Lalitha Prasad (49kg) and Sandeep Sharma (75kg).